The question is, would this feature work under a APORTEUS build of @neko? I mean, I think neko builds, use systemd and normal PORTEUS use init. Is there any way to execute an script upon module activation in systemd? It's a shame now that the GNOME journey in the desert had come to an end (...). whether it would start upon module activation, i don't know.. i guess.. an enabled service appearing in the service dir should run.. I'm trying to set some gsettings and update caches whenever a module gets activated. ah. well.. you may not need to use systemd for this at all..
i don't know what aporteus' activate script looks like, presumably it doesn't include the 'xactivate' elements..
echo "$0 module1.xzm module2.xzm module3.xzm"
# functions if we are only in text mode. ## Insert module(s) to /union. ## Collect the results into an array and show one final report at the end. # 4 Cannot read module data. Corrupt? 4 Cannot read module data. Corrupt? #echo "Updating shared library links:  /sbin/ldconfig"
#echo "Updating MIME database:  /usr/bin/update-mime-database /usr/share/mime"
echo "Updating icon-theme.cache: /usr/bin/gtk-update-icon-cache -t -f $x"
echo "Updating X font indexes:  /usr/bin/fc-cache -f"
echo "Updating glib schemas: /usr/bin/glib-compile-schemas /usr/share/glib-2.0/schemas"
echo "Updating GIO cache: /usr/bin/gio-querymodules /usr/$lib/gio/modules"
echo "Updating GTK immodules: /usr/bin/update-gtk-immodules"
#echo "Updating certificates in /etc/ssl/certs: /usr/sbin/update-ca-certificates --fresh"
echo "Updating GDK pixbuf loaders: /usr/bin/update-gdk-pixbuf-loaders"
echo "Updating Pango querymodules: /usr/bin/update-pango-querymodules"
Will try in the next days and report how it goes. I added an element some time ago that executes scripts on activation. Just place your script in /etc/activate inside the module. It will automatically receive the start argument in case it is a service. In addition to portability, PORTEUS is a rock-solid solution. This is mainly because the packages included in the 'base' system are very stable and are very well assembled, providing a very robust architecture in the form of overlayed filesystem. From there a hybrid system arises, in which it is possible to maintain an environment as predictable as is necessary, allowing the adition of new features by simply activating a new module. However, when a new module gets activated, there is a danger of overlapping a layer, either obsolete with known vulnerabilities, or untested that introduces new ones ('promiscuous mode'). For example, yesterday I realized that the module I had created for Gnome-mpv included version 0.26 of mpv when the system already had 0.27. This is the other reason why I am interested in the concept of executing a script at activation stage, to control that a series of essential packages (call it supermodules or superpackages) are not supplanted by incorrect versions. And I'm not talking about mpv, of course. Now that similar modular packaging architectures (flatpack, snap, appimages, etc.) flourish, it might be tempting to offer the possibility of transforming these packages into the PORTEUS ecosystem, just as it does with rpm and deb, for example. In these cases, the package would already incorporate all its dependencies (with the advantages and disadvantages outlined above). Has the DEV TEAM considered adopting any method to allow the use of these packages? If so, is there any way to do it in a 'controlled' way? I'm thinking of a script that controls a certain list of 'core' packages, until a stable version arrives, or incorporate some sandboxing, that would allow to preserve those superpackages, for example, if they were executed from the 'base' folder. Also, another solution would be asking the user at inserting time, which priority that package (not the whole module) should be given (maybe it's already done and I'm not aware). I am not a programmer, but I have been using computers and operating systems for 35 years now, and I more or less understand the concept of UnionFS and this is one of the sites where I learn the more, and that's why I would like to know your opinion, or which would be the best practice to update porteus in its itinerant incarnation. Sorry for transforming a simple question into a general discussion brainstorming... Feel free to move the post, or tell me where to put it. Thank you very much for sharing your knowledge and keep up your great work. Has the DEV TEAM considered adopting any method to allow the use of these packages? We have a similar concept with 'bundles'. They are simply modules that contain all dependencies for a given desktop environment. They still suffer the same disadvantages as above but the advantage is an app that works OOTB. Our package manager (USM) handles dependencies more readily. It will check if a running system needs a dependency or already has it installed. At the end it will create either a bundle or individual modules in the output directory that contain only the dependencies required for the given system. Also, another solution would be asking the user at inserting time, which priority that package (not the whole module) should be given (maybe it's already done and I'm not aware). Here we enter the point at which we must decide if we are creating a system for semi-advanced users or beginners. Most beginners would have no clue what package requires what priority. The package manager gives users the choice of which package they prefer for a required library and some users have reported even this is a little intimidating. After trying many options I decided to settle on the package manager that arranges dependencies for the system that it is on, along with the option of bundles for people that have no idea what to do. Hand in hand I think they offer a rounded solution. Going around this topic, so @François and I can get Arena Chess module properly assembled. 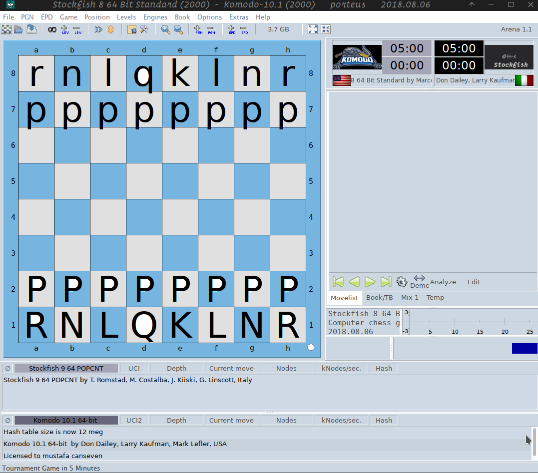 Because Arena Chess, uses his own fonts to render the pieces, and to use figurine notation, I need to update font cache (fc-cache -fv) before program launch. (I'd like to solve this both in NEMESIS -OpenRC- and PORTEUS -SysV-).